Over two million Australians saw Lauren Huntriss take ‘husband’ Matthew Bennett’s virginity on Married At First Sight this week. And months after that memorable night took place, it appears that Lauren and Matthew are still going strong. 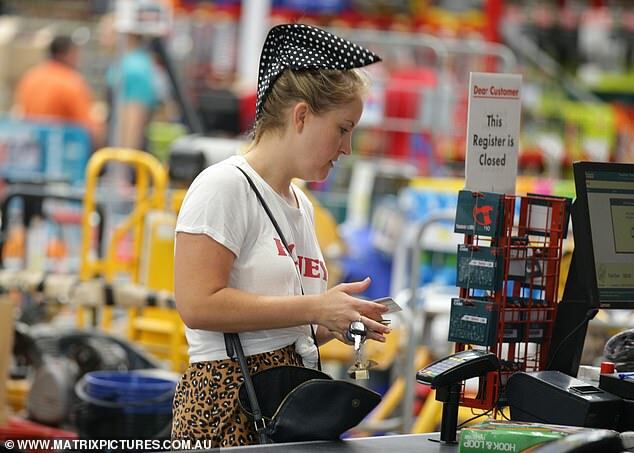 On Sunday, Lauren was spotted wearing her wedding ring during a shopping trip to Bunnings Warehouse in Sydney. The 31-year-old makeup artist was dressed casually in a cheetah print skirt and a white T-shirt that was knotted at the bottom. She wore flat sliders on her feet for comfort and tied her blonde locks up into a loose bun using a polka-dot wrap. At one point she was seen twiddling away on her mobile phone, possibly texting Matthew, who is based in Queensland. Matthew was hospitalised with anxiety over his pre-coital nerves on Tuesday’s episode of Married At First Sight. But the 30-year-old managed to overcome his fear of intimacy, eventually losing his virginity to the keen Lauren. The videographer explained to TV Week that it was his wife’s ‘compassion’ that put him at ease and made him decide to take the next step. Matthew said he realised Lauren was ‘the one’ after they shared an emotional heart-to-heart about his difficult childhood. ‘I definitely felt closer to her, I felt a lot more comfortable,’ he said.